Persian cats are one of the breeds known to suffer from PKD1 (polycystic kidney disease). PKD1 is an inherited disease primarily found in Persian cats, related breeds, and cats with Persian ancestry. Other forms of PKD1 occur in other animals and in humans. PKD1 was occasionally reported in scientific literature as early as 1967, but actual study into this disease did not begin until 1990. In 2004, the mutation responsible for PKD1 in Persians and cats with Persian ancestry was identified. There are more than 15 polycystic kidney diseases in cats besides PKD1. However, PKD1 was the most prevalent and usually had an early onset. When a cat has PKD1, multiple cysts develop in both kidneys, sometimes leading to chronic kidney insufficiency or failure. Problems occur when these cysts start to grow and progressively enlarge the kidney, reducing the kidney's ability to function properly. Some of the signs of kidney insufficiency are increased thirst, increased urination, decreased appetite, weight loss, vomiting, and lethargy. Cats affected by kidney insufficiency due to PKD1 are usually identified when they are between three and ten years of age. PKD1 can be diagnosed by ultrasound of the kidneys, however, this test is only as good as the day it is done, cysts can develop later. 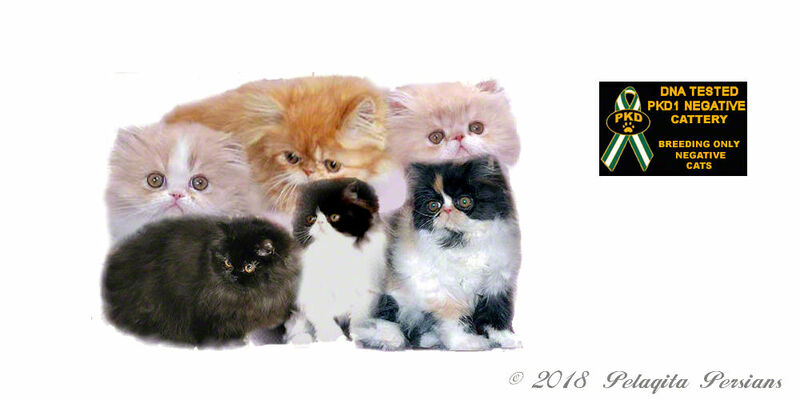 Therefore, the ONLY reliable test for PKD1 is a DNA test Persian cats and cats with Persian ancestry. In 2004, the University of California Davis developed a DNA test for feline PKD1. Please note: Pelaqita Persians uses and recommends this testing facility. IMPORTANT NOTE: Other facilities have their own tests. However, they are not based on the same protocols as those at UC Davis (as they developed the test), therefore I would be skeptical of any PKD1 results from any testing facility other than UC Davis. (Disclaimer: This is Pelaqita Persians' opinion only).